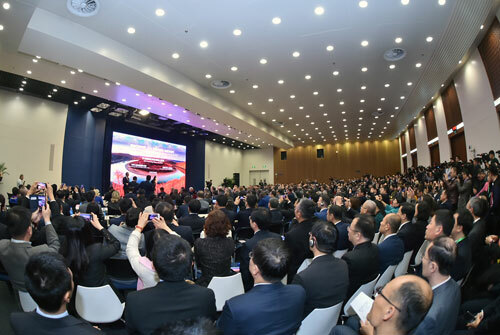 On November 12, 2018, the Ministry of Foreign Affairs held the 16th promotion event presenting Chinese provinces, autonomous regions and municipalities under the theme of "China in the New Era: Heilongjiang, a New Path to Revitalization in Partnership with the World" at the Blue Hall of the Ministry. 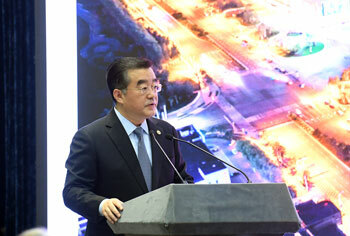 State Councilor and Foreign Minister Wang Yi delivered a speech. Secretary of Heilongjiang Provincial Committee of the Communist Party of China (CPC) Zhang Qingwei addressed the event, and Governor of the People's Government of Heilongjiang Province Wang Wentao gave the presentation. More than 500 people including Secretary of the CPC Committee of the Ministry of Foreign Affairs Zhang Yesui, Assistant Foreign Minister Zhang Hanhui, diplomatic envoys in China from over 120 countries, representatives from international organizations in China, delegates from industrial and commercial sectors, Chinese and foreign experts, scholars as well as journalists attended the event. Wang Yi expressed that Heilongjiang Province is the first place to embrace sunrise in China. Splendid history was once created here, and now it is ushering in a brighter future. Not long ago, General Secretary Xi Jinping made a research trip to the three provinces of the Northeast China, during which he made important deployment on the comprehensive revitalization of the Northeast China in the new era, and stressed to advance the revitalization of the Northeast China with new look, new undertakings and new accomplishments. In line with General Secretary's important guiding spirit, Heilongjiang Province has been sticking to the leading role of innovation, speeding up the transformation from old driving forces to new ones, forming the new drivers for development through reform, and building the new highland for foreign cooperation through opening up, so as to blaze a new path of comprehensive revitalization. Wang Yi stressed that the first China International Import Expo (CIIE) was successfully held last week, marking the significant move of China focusing on driving a new round of high-level opening up. Economies make progress through exchange and inter-connectivity and fall behind because of seclusion and closedness. 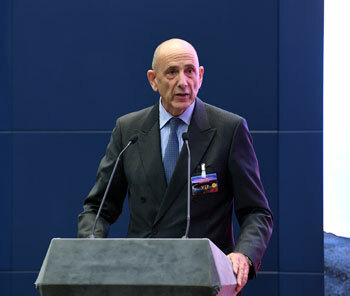 As President Xi Jinping announced in the key note speech at the CIIE, China will remain a strong advocate of openness at the global level, and will continue to act as a stable engine of global growth, a big market with enormous opportunities and an active supporter of global governance reform. 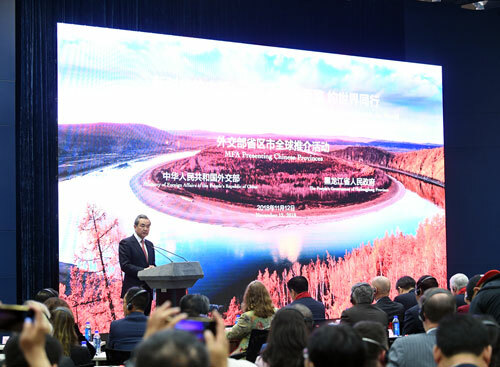 Wang Yi expressed that Heilongjiang Province, a gateway of China's northeastern region, boasts unique advantages in China's new round of opening up, which will help it participate in the construction of the China-Mongolia-Russia Economic Corridor in a more active manner and build itself into an important hub of economic and trade cooperation in Northeast Asia. 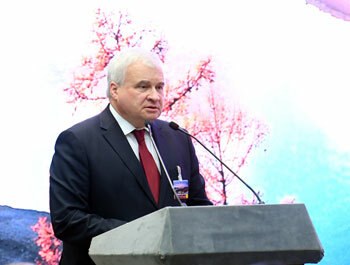 Meanwhile, Heilongjiang Province will participate in the construction of the Belt and Road Initiative with a broader perspective, connect with Eurasia by opening China-Europe freight trains, and enhance mutually beneficial cooperation with countries along the route. It is hoped that all countries will seize the new opportunities brought by China's deepening of reform and opening up, work together with China, and join hands with Heilongjiang Province to create a beautiful future of mutual benefit and reciprocity and win-win cooperation. 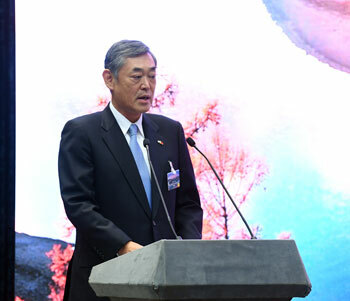 Zhang Qingwei expressed that General Secretary Xi Jinping's important speech has further charted the course for Heilongjiang Province to take a new path to revitalization and thrive again, which shows that the revitalization of the Northeast China has entered into a new era of comprehensive and all-round revitalization. Heilongjiang Province has been striving to translate its geographic advantages and resource endowment into new driving forces of development, making every effort to forge new engines for innovative development, speeding up its pace in building a new system of open economy as well as making all-out efforts for a new landscape of all-round opening up. 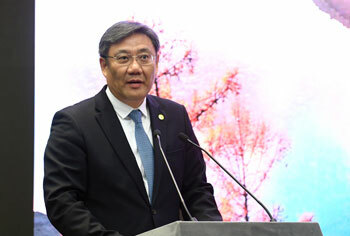 Wang Wentao presented Heilongjiang Province from such aspects as tourism, modern agriculture, equipment manufacturing industry, emerging industry and international cooperation as well as invited friends of various countries to share cooperation opportunities and development achievements together. 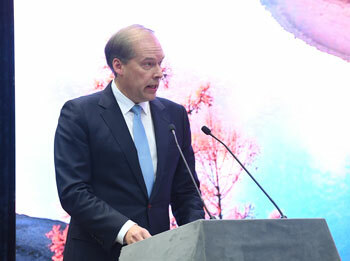 Russian Ambassador to China Andrey Denisov, Finnish Ambassador to China Jarno Syrjala, Japanese Ambassador to China Yutaka Yokoi and Dutch Ambassador to China Everardus Kronenburg introduced each country's exchanges and cooperation with Heilongjiang Province. They fully recognized Heilongjiang Province's geographic advantages and potential for economic development and expressed that they will actively push their own countries to further strengthen friendly exchanges with Heilongjiang Province and expand mutually beneficial cooperation. Prior to the promotion event, the People's Government of Heilongjiang Province held a business symposium. 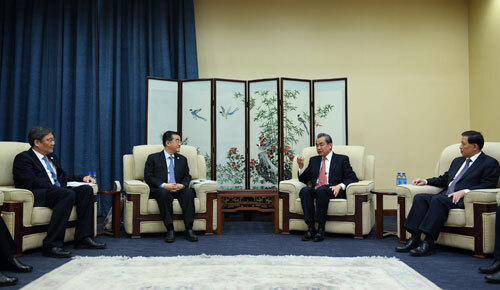 Assistant Foreign Minister Zhang Hanhui and Vice Governor of the People's Government of Heilongjiang Province Cheng Zhiming attended the symposium.